Come for the Gems; stay…for them, too. Houseki no Kuni — “Land of the Lustrous” — is that CG-made Anime that actually doesn’t look like crap, for a change. In fact, this Anime, I feel, absolutely had to be made with CGI or else it would’ve looked bad. As someone who likes collecting and studying rocks and gems, as well as watching the odd Anime, to get both aspects in one show was sure a treat for me. In a nutshell, 28 (or so) “Gems” take on anthropomorphic (asexual) form and do battle against the invading “Lunarians” who in turn wish to turn the Gems into jewelry for their own sake. Each Gem embodies the properties of their mineral counterpart, for example: Diamond-class Gems like Dia(mond) and Bort(z) have a Mohs hardness of 10, but Dia is prone to breaking by impact shock while Bort is not. 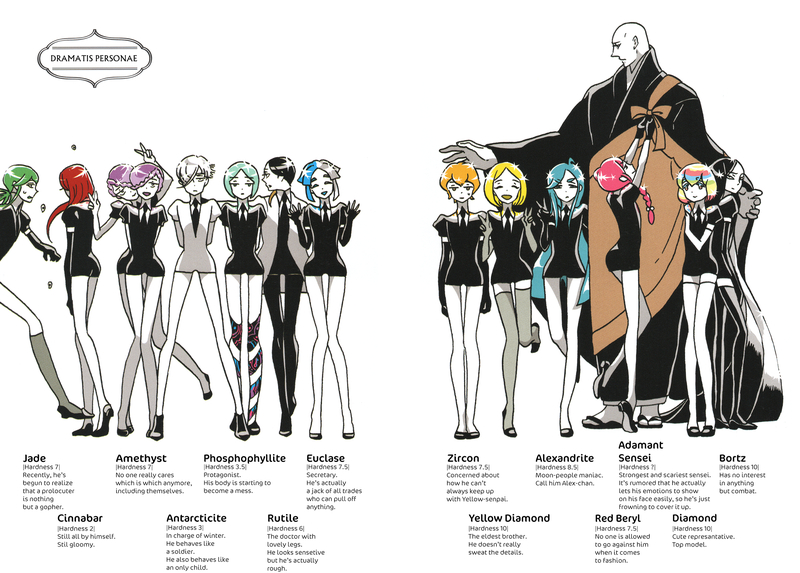 The main character, Phos(phophyllite), has a hardness of just 3.5, as evidenced in their breaking easily and often throughout the series; they’re also a platy, mica-like mineral, that can take in other matter easily, as evidenced in the way that they’re able to replace their missing limbs with those made from other minerals. While Phos’ personality is mostly adorable, and their maturation later in the series is mostly admirable, I’m still gonna divert from the crowd and favour Cinnabar above all. Primarily, this is because, like me for much of my life, Cinnabar’s a social outcast despite being incredibly intelligent and surprisingly capable. Their wisdom comes from the hardship provided by not wanting to accidentally harm their Gem-mates with their production of pure mercury, at times uncontrollably. Cinnabar, therefore, is cognisant of things that all the other Gems cannot possibly be able to know themselves; things that only misfits tend ever to be aware of…. Cinnabar’s also, without really realizing it, the greatest influence on Phos. Despite wanting to be taken away by the Lunarians, Cinnabar never once allows the Lunarians to actually take them away. I feel this is because they’re subconsciously begging for someone, like Phos, to give them a meaningful place in the world — like any social misfit does, in one way or another. In return, Cinnabar becomes Phos’ primary “saviour”; nobody else aids Phos like Cinnabar does, nor as often. Though Phos made a change of mind and appearance to be more like Antarcticite, after their being taken away, it’s Cinnabar that ultimately gives Phos a truly meaningful work — to find the truth about the Lunarians, and Kongou-sensei’s relation to them. Cinnabar knows full well what Phos has now become, but chooses to team up with them anyway for the sake of having some feeling of what it means to have a friend. 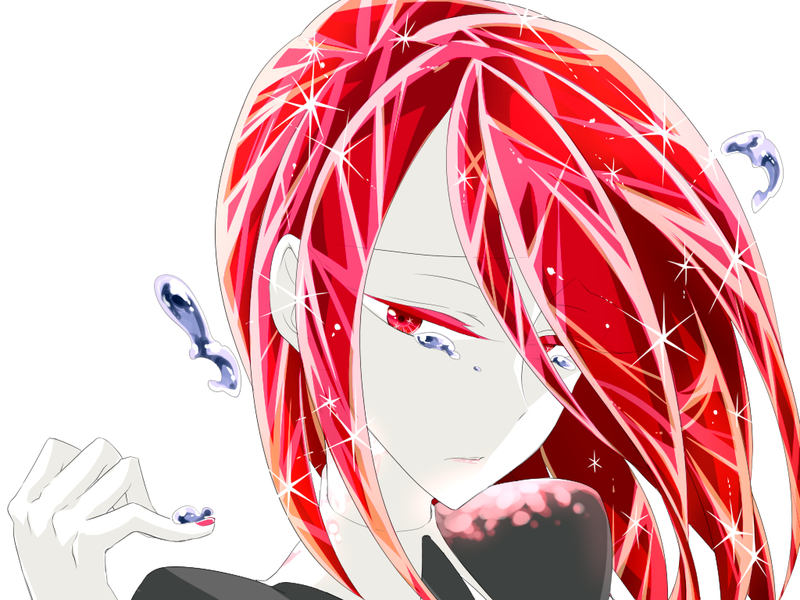 Finally, being the truly weakest Gem (they’re actually an ore mineral, but whatever…) of them all, weaker even than Phos at Mohs = 2, Cinnabar is most aware of needing to find a way to overcome that weakness in order to do anything meaningful — and they do just that. In the end, this makes Cinnabar strong. Phos, on the other hand, does what many “normal” people tend to do on realizing how weak they actually are: Just complain about it, until stronger people find a way to make them stronger for them. Enough spoilers…, go ahead and watch this Anime!